Uganda is a country coping with a severe energy crisis resulting in frequent power cuts. In addition, access to mains electricity in rural locations is limited. Given that mobile phones require power, and access to power can be unpredictable – how do people keep their mobile phones and other electrical devices charged? Last July a Nokia research team travelled to Uganda and explored this issue as part of a more in-depth study into shared phone use. 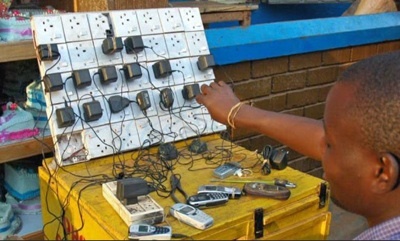 There are two forms of mobile phone battery charging services in Kampala – either offered as an additional service by phone kiosk operators or as a stand alone service. 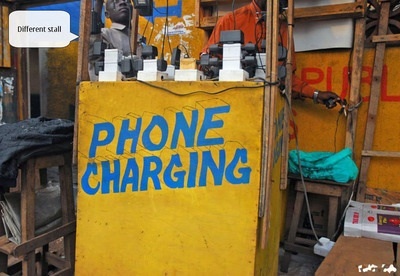 It costs 500 Ugandan Shillings (0.2 Euro) to have a battery recharged similar to the price of 2 or 3 phone calls. Whist both services appear to thrive there are a number of barriers to use: customers cannot use their phone whilst the battery is being charged; the customer risks, or perceives the risk that their battery being swapped for an inferior one; a perceived risk of phone theft – signs that suggest service providers are not responsible for loss or theft are evident. For many Ugandan rural communities with no access to mains power car batteries are the primary means of providing electricity to the home. Businesses such as bars also run off car batteries but they are more likely to have their own power generator. A used car battery costs 30 to 40 dollars and can keep a household powered for a month, though in a bar the same battery might last a week. The homes we visited ran electrical items included radios, CD players, television and domestic lighting. 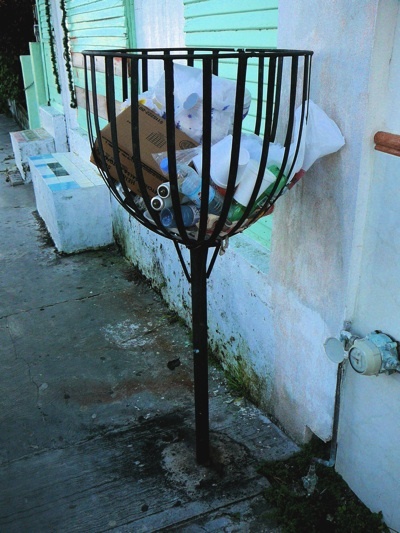 On the island of Cozumel, the scuba divers haven near Cancun, Mexico, local residents have devised a trash basket that hovers above ground. I think this design does two things> 1) It raises the garbage above rat height, although they may still be able to get up the slippery pole (rats are amazing). But it must decrease the ease, and keep some of it out of reach. 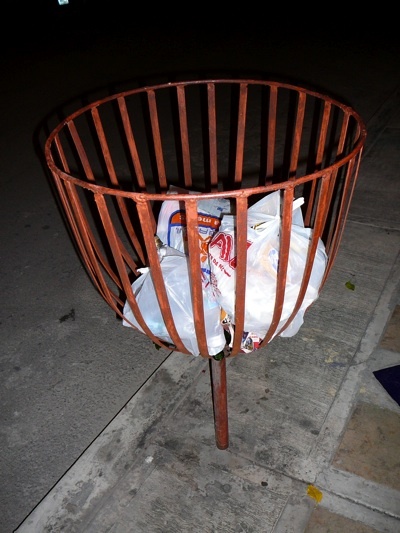 2) It makes it easy to spot recycleables, like cans and bottles, or even other junk someone else might want. Throughout Mexico “topes,” or speed bumps, are ubiquitous. These can be metal pods arrayed across the road, or asphalt humps, or even significant concrete wedges. You really do have to slow down, and almost stop to crawl over them. There is usually a sign warning they are ahead, because if you hit one going fast you can total your car. In other words, the topes are effective. Small towns will have one coming and going, because they are more effective than speed limit signs, which everyone would ignore. But even highways have them, near intersections or bus stops. Along the southern coast of the Yucatan, beyond the last electricity and asphalt, at the end of the road, the Mexicans still want the benefit of a tope, but what to do on an unpaved mud/sand road? 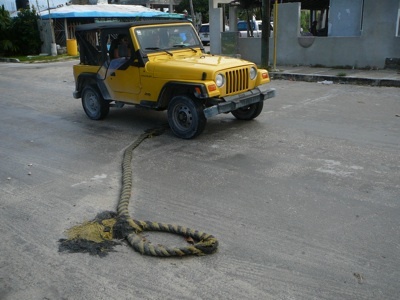 Well along the coast, where old ship ropes can be found, the solution is to lay a big fat rope across the road. It works, at least for a while, but it is easily replaced. This one is strung across the road in the small pirate town of Xcalak, Yucatan.